Ever since the five-year time jump following Rick Grimes’ departure, The Walking Dead has been alluding to some horrific sequence of events that transpired in between Rick’s “death” and the present day, some incident or incidents that drove the communities apart and left literal scars on a few of our characters. “Scars” finally starts to address those events, and not to be glib, but it’s the most fucked-up story the series has delivered in quite some time. This isn’t exactly the first time kids have died on the show. Technically, the whole series kicked off with Rick Grimes shooting a child in the head—but they were already a walker, so it doesn’t really count. (A similar dismissal can be applied to Michonne’s offing of the Governor’s undead daughter.) True, back when Carl was an unstable little psychopath he killed another teenager, but the best point of comparison would be Carol’s execution of little Lizzie Samuels in season four, telling the girl to “look at the flowers” before shooting her in the head. The death of a child is always a brutal thing, but for a woman currently carrying her own unborn kid to have to murder another? There’s something especially dark about the scenario. And Michonne isn’t forced to kill just one kid here—she takes out a whole crew of them in the attempt to recover Judith and the other children taken from Alexandria. This episode is another example of The Walking Dead’s oft-bifurcated structure making evaluation more difficult, because while the flashback pretty much hits as hard as was intended, the current storyline flails in more ways than one. (Let’s come back to the weaker plot—it’s so much less memorable, anyway.) The show needed something potent to deliver on the promise of an unknown tragedy, and this one-act play featuring Jocelyn (Rutina Wesley)—a long-ago friend of Michonne’s—and her band of murderous little shits hits all the right beats for a thematically on-point installment of the series. Does it tell us anything we haven’t heard before? Not really, but coming at this point in the season, where we’re pretty much split narratively between “friends are good” and “strangers are bad,” it’s a harsh reminder that, more often than not in this world, trust carries a terrible price, and things are rarely as clear as they seem. When Michonne first sets eyes on Jocelyn and says her name in a disbelieving way before we cut to credits, it sent me scurrying to make sure this wasn’t some one-off character from long ago I’m supposed to remember. 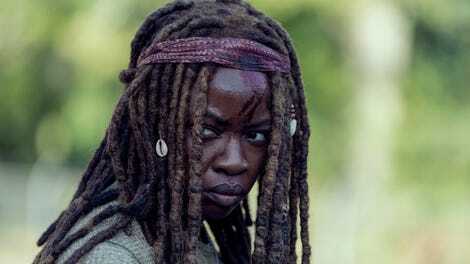 Nope—it’s just a buddy of Michonne’s from college, now seemingly playing matriarch to a gaggle of kids whose parents didn’t make it. (They “broke,” as Jocelyn puts it, unlike their more resilient children.) And that’s part of why her story is so effective: It’s not just that she says all the right things to lull Alexandria and her long-ago friend into a false sense of security. It’s that the kids are equally good at playing their roles, in large part because Jocelyn made it “a game,” as they admit later. Kids are such an advantageous weapon because, even after they’ve been revealed as co-conspirators willing to put an arrow in Daryl, Michonne—presumably like many ill-fated adults before her—can’t quite believe they’re willing to do what they do. There’s not really any reasonable explanation as to why Jocelyn and her kids would be branding Michonne and Daryl with an iron; but then again, they’ve clearly developed some sort of ritualistic patterns geared toward Jocelyn’s ideology, and like lots of Walking Dead moments, the imagery plays better than the logic. However, it does provide the zero-sum rationale as to why Michonne chose to shut down Alexandria’s relationships with the other communities. As she explains to Judith in the present day, she was trying to do whatever she could to keep her loved ones safe, even if she knew it would hurt other people she cared about. She may love the others, but she loves her family just a little bit more. Her whole conversation with Judith, however, is part of the problem with the entire subplot in the present day. Since the comical re-introduction of Judith as a distaff mini version of Rick, the show has continually returned to the idea that she is mature to the point of absurdity, the kind of wise-beyond-her-years intelligence that probably does exist in real life, but is so rare as to seem ridiculously implausible. Every conversation where Judith schools Daryl on the morality of his behavior, or teaches Michonne the error of her ways not through some child-like example of good deeds, but via articulate discourse that wouldn’t even sound right coming out of the mouths of some of the adults, enters eye-roll territory. Maybe it’s ageism on my part, but that young of a kid expressing Freud-like levels of emotional intelligence isn’t working at all. Still, this was an undeniably powerful episode, thanks to that flashback. Of course, we still don’t know why Hilltop would be so pissed at Michonne as a result—presumably her decision to isolate Alexandria leads to a situation where Maggie and Hilltop come calling for help, and Michonne refuses. It’s lucky Judith’s adopted mom has had a change of heart since then—given the final shot of Whisperers seeing Lydia entering the Kingdom, Ezekiel’s people are about to need all the help they can get. I’d just like to point out that, if Judith hadn’t gone off half-cocked on her own, Daryl et. al probably would’ve arrived at the Kingdom without being seen—thereby preventing the Whisperers from knowing Alpha’s daughter was in their protection. In other words, Judith’s misguided plan of blindly stumbling into the woods might result in getting a whole bunch of people killed. Ah, love! There were a few abrupt edits around action in the flashback here. It seems even The Walking Dead isn’t comfortable showing little moppets getting murdered. Danai Gurira delivers a great performance here. 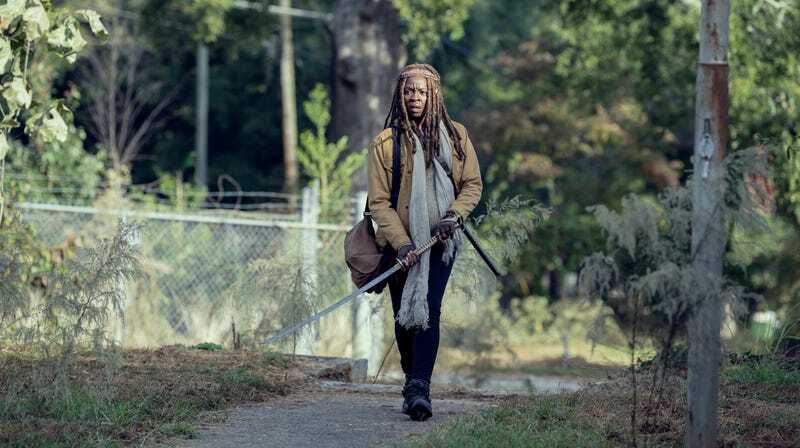 It’s easy to forget, since she’s been so good for so long, but her blend of toughness and deep wells of grief continually threatening to bubble up from within gets a stellar workout, particularly in the character’s lip-quivering heart-to-heart with Daryl. Another episode, another round of Negan’s Prison-Bound Straight-Talk Express. Please kill him or let him out; this Oracle-Of-Illadelphi thing is tiresome.